Advertising Flags with Silk Screened Imagery are Unique Promotional Displays! Feather and Business Signs are Especially Effective When Hung from Extra Tall Flagpoles! 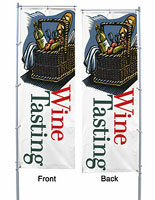 Purchase Advertising Flags for a Retail Store or Mobile Trade Show Presentation! These advertising flags come complete with TriPole flagpoles and two-colored custom graphics based on your submitted designs. 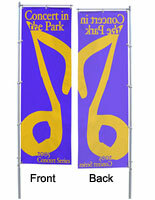 The promotional feather banners feature a height of 13ft. 1in. and are highly functional displays for live concerts, street fairs, tradeshow events and more. 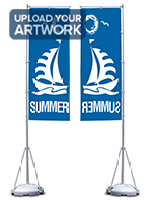 These advertising flags, also called feather flagpoles, are engineered to hold 31-1/2"w by 94-1/2"h banners. At such massive size, these outdoor fixtures offer the perfect method to present sponsorship, advertise goods or build brand awareness. Advertising flags are designed to accommodate winds and weather, but they work well for interior signage solutions as well. Another great advantage of these advertising signs is that a single individual can effortlessly set the unit up in only a few minutes. 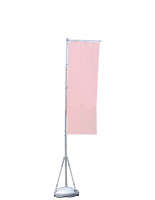 These advertising flags have aluminum flagpoles that telescope for concise storage. Your graphics are easily attached to the support at the ground level. Then each section of the pole is hoisted and locked in place. 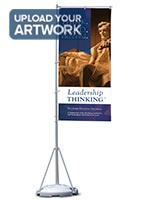 The horizontal feather sign frame is an armature that ensures banners are always outstretched. 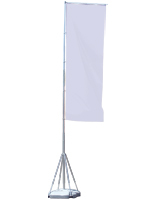 This flag arm also spins around with the wind to handle the load of gusts. At the bottom of the display, there is a 3 leg support and base that is filled with either sand or water to provide the best stability. The unit fits into the included travel bag when not in use. These advertising flags incorporate 2-color signs rendered from your own artwork. The graphics are printed onto a durable knitted polyester fabric using a silk-screening process. Although the graphics are printed on only one side, the heat-transferred prints infiltrate the fabric for a reverse image on the backside. 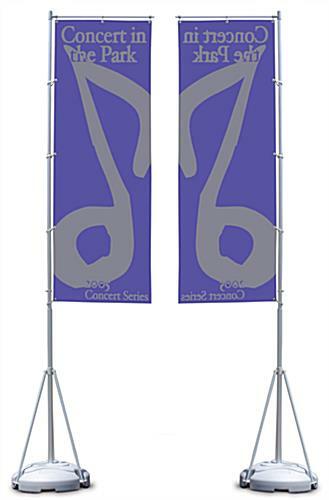 Because these feather banners are silk-screened, a 10-unit minimum order is required. When moving the displays from one event to the next, use the enclosed carrying case for safe lifting. 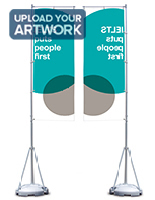 We are proud to offer flags for these TriPole advertising flag systems. We have researched many different options and have come up with a solution that we feel is best and reasonably priced. These are real flags that will blow in the wind, not heavy vinyl banners. Although they are not the most inexpensive banners you may find, with proper care and use they will last for years without fraying while maintaining their vivid coloration.